Chief of Navy Chaplains, Rear Adm. Louis V. Iasiello, left, watches with Commander, Naval Reserve Force, Vice Adm. John Cotton as newly commissioned Lt. j.g. 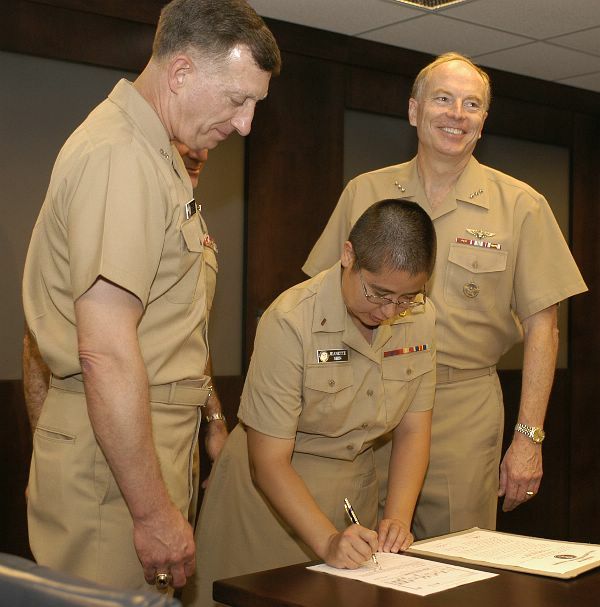 Jeanette Gracie Shin signs her Oath of Office paperwork in the Pentagon. WASHINGTON (NNS) — The Navy commissioned the military’s first Buddhist chaplain in a ceremony at the Pentagon July 22. Chief of Navy Reserve, Vice Adm. John G. Cotton commissioned Lt. j.g. Jeanette G. Shin in front of several of her family members and friends, making her the Department of Defense’s first Buddhist chaplain. After taking her oath of service, Shin expressed her gratitude to her peers, and said she looks forward to making a difference in the fleet. Shin’s commissioning is an important moment for the Navy’s Chaplain Corps, as it continues to improve its diversity to serve Sailors and Marines from a variety of religious backgrounds. Shin was praised for her tremendous accomplishment and welcomed to the Corps by her peers. Shin earned her bachelor of arts degree from George Mason University in Philosophy and Religious Studies in May 2000. She earned her master of arts degree in Buddhist studies from the Graduate Theological Union/Institute of Buddhist Studies in Berkeley, Calif., in May. Shin is currently stationed at the Navy Reserve Center in Alameda, Calif. Text and photo first published on the U.S. Navy website, 23 July 2004.